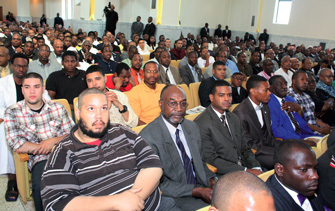 Minister Farrakhan addressed a capacity crowd at Mosque Maryam with overflow areas set up in the Muhammad Univ. of Islam gymnasium on July 1, 2012. CHICAGO (FinalCall.com) - The Honorable Minister Louis Farrakhan wrapped up a busy weekend of activities delivering a profound message titled “All is Vanity” at the Nation of Islam’s international headquarters Mosque Maryam July 1. The mosque sanctuary was filled to capacity with an overflow in the adjacent Muhammad University of Islam. Thousands also viewed live via Internet webcast. “The whole human family has come under death for the whole human family has been blinded by the touch of Satan. And now that Satan’s time is up, he must be exposed, and his work destroyed completely so that a brand new world and civilization will come into existence,” said Minister Farrakhan. This particular message encouraged self-reflection, and self-analysis to determine what drives people to do what they do, as Minister Farrakhan challenged the audience to examine their lives. As a scriptural base, Minister Farrakhan used the Book of Ecclesiastes in the Bible. Frequently referring to it and reading directly from it throughout his message, he said he studied it often as a young student minister and his understanding of it continues to grow. Knowledge, titles, material possessions are just some of the things used by members of the human family to elevate themselves above others. Neighbors, family members often become envious of even modest advancements and achievements of others. At the end, many are striving to achieve vain desires and vanity is empty and worthless, said Minister Farrakhan. 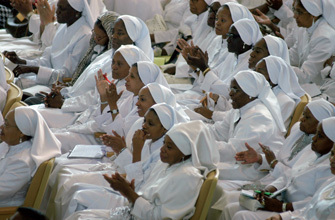 (L) Audience members listen to Minister Farrakhan’s message. Photos: Richard Muhammad (R) Following his message, dozens of men stood to join the Nation of Islam. The thinking and actions of the members of the human family are far away from what God intended. Many are wasting their lives, wasting the gift of life that has been given to them by God, he said. The spirit, or the energy of life, if used properly to engage the mind and to build the mind will enable one to do things that will live on after passing away. Many selfishly only look out for themselves, thinking nothing of others. “You mean, when we pursue things that deal strictly with self, that’s empty and worthless? That means as long as I live, if all I look out for is ‘me’ then in death, my life has been worthless,” he said. Men from around the country came to hear the Minister’s message at Mosque Maryam July 1. Excessive pride in one’s appearance, intelligence, or power can also be self-destructive, he added. “It’s all empty! It’s all vain! It’s all worthless,” said Min. Farrakhan because no matter how knowledgeable or powerful one is, none of that knowledge, or power can endure. This is a reality that some are unable and unwilling to confront, he said. Those with many material possessions and wealth in many cases are still not fulfilled, because much of what is desired is simply vanity, done with the goal to impress others, or exalt one’s self above others. “Isn’t it something, the more you get, the more you want and then you never seem to get enough?” said Min. Farrakhan. All are equal in death, all become dust, he said. “Fools and wise men, all of them die,” said the Minister. “The question is, what are you doing with your life? People are always comparing themselves to others, and worried about what others think demonstrating misplaced priorities. The Minister gave an example of someone who would spend money for a comedy show or another form of entertainment with unpaid bills and no food at home for their children. The end of life is for all of us to experience, said the Minister. The prophets of God came in to the world just like any ordinary people, the difference is what they did with their time. Even when family members die, although saddened for the moment, life still goes on. Using himself as an example, Minister Farrakhan said that for a time, he pursued material possessions. He has also spoken in the past about his love for the crowd’s adulation during his earlier career in show business. Reflecting on the words of his teacher, patriarch and Eternal Leader of the Nation of Islam, the Most Honorable Elijah Muhammad, he was able to put those vain desires within himself in check. “There is something about self-knowledge that exalts you that can also be the means of your destruction if you think more of yourself than you should,” he said. “Once you begin to equate yourself with the truth that you carry, you’ve lost it,” he warned. He is no longer that way, and he cautioned officials within the Nation of Islam against thinking too highly of themselves because of their positions or levels of authority. God is the author of all things, he added. “When you get knowledge and think that knowledge has made you superior, think about God, because everything you are looking at is what He created and some things you know, some things you don’t know and some things you will never know!” said the Minister. “There’s nothing or no one worthy to be worshipped but the one who originated all of this we are blessed to live in! The Minister Farrakhan described how the Honorable Elijah Muhammad told him it felt like a knife turning in his stomach when he thought about the Nation of Islam falling, however, he also said it would rise and never fall again. There is something that has to be done in your youth before time comes, said the Minister. The Minister took a brief moment to address those who have criticized him for developing a relationship with the Church of Scientology founded by L. Ron Hubbard. “I have been taking a lot of criticism for attaching the Nation to the Church of Scientology,” said the Minister. “I don’t mind the criticism. I know that you don’t understand, and as the Qur’an says unfortunately, you are a people that dispute without knowledge,” he added to the cheers of the crowd. Minister Farrakhan said in all of his 57 years working for the redemption and liberation of Black people, his history shows that he is totally in love with his people. It defies logic that he would introduce something that would be harmful for the community. He said those individuals seeking an education typically do not question the religious or political beliefs of those with the specialized knowledge they are seeking. Likewise, when one is seeking medical assistance, the only question is whether the practitioner has the knowledge and skill to solve the medical problems that exist. The suffering that Black people have experienced is unmatched because they have been deprived of self-knowledge, including history, and culture. That also includes 400 plus years of brutal chattel slavery. This collective experience prevents Black people from working together to make progress. It is for that reason he has moved the Nation of Islam to utilize the process in Dianetics called auditing. Since many negative experiences occur below the level of consciousness, many are unaware of their damaging effects. Given the choice, many would prefer for these incidents to remain hidden. Auditing brings them up and discharges the negative energy contained in the experience. Minister Farrakhan likened it to the work of Jesus, who in the scriptures exorcised demons. “All the prophets taught us to seek truth from the cradle to the grave. Wherever knowledge is, you should seek to be a possessor of it,” he said. Reverend Alfreddie Johnson of the Church of Scientology and the World Literacy Crusade said he was brought to tears by the message and said he admires the Minister’s courage and integrity. He said this message will go down in history and he will play it everywhere he goes for any detractors and naysayers. “If we want to gain eternal life, it is gained by imbuing pro-survival service to others. If you are not making things better, it’s all vanity,” said Rev. Johnson. “It was the most profound, the most outstanding and direct, honest, sincere to the heart, to the spiritual being, delivery of truth I’ve ever seen demonstrated,” he added. “This is why he is the lead wire, because he is connected to the source of this kind of truth in the modern context,” said Abdul Hafeez Muhammad. “From this, I want to live a more valuable life and whatever I thought was value before, I have a different perspective on value today to make a greater step in productivity,” he added. “The Minister today has given us guidance that will allow us to move forward beyond the stumbling blocks of self and individuality,” said Sultan Rahman Muhammad, Arabic teacher at Muhammad University of Islam and great-grandson of the Honorable Elijah Muhammad. “What lives beyond the grave is that which we do for humanity,” he added. Kahil Muhammad, a 23-year old student in the ministry at Mosque Maryam said this message needed to be heard by the members of his generation. He said Minister Farrakhan is the only elder that the youth are listening to and admire because he corrects without condemning. “Today, I believe that Minister Farrakhan did for us as Black people, what he gave Jesus credit for doing in biblical history, and that is he showed us the way out. He showed us how to be victorious over death and he talked into our deepest fears and helped us get over those fears by confronting them and sharing with us the reality of an ever-living, self-subsisting God,” said Atty. Ava Muhammad. “What he showed us is that even though the flesh will ultimately decay and die, the spirit of Allah that is breathing life into all of us goes on forever, so the issue is not how much time we have—because it is limited—the issue for us is what we do with that time,” she added.